“Pig farm” and “slurry” were Fiona’s first tasting notes on this one. And while it’s true this nine-year-old bottle of Chimay Grande Réserve had strong agricultural notes, I found it outstanding just the same. 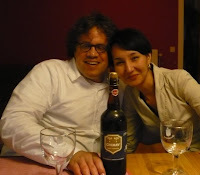 Interestingly, the 1999 was quite different from the Chimay Grande Réserve 2001. Rather than creamy and smoky, this one was a bit thinner and more pungent. “Rotten leaves and mushrooms”, said Marcus. I thought hemp and wet linen, with a few sweet notes, and though it had no fresh fruit taste, I detected a kind of black cherry liquor flavour. Marcus compared it to a non-alcoholic German Malzbier, but the alcohol level in this was high. Not that you could taste it -- the great mix of flavours hid the fumes very well -- but you could feel it. “With every sip, I feel more and more drunk”, Galima noted. She was quite right, and in that regard, the 750ml split between the four of us was plenty. When bottled, it was 9%, and I’m guessing the extra years of bottle fermentation probably put it up to 12 or 13%. That’s just a guess, though. The taste was so complex and rich, so full of organic, mucky malt... We suddenly remembered a hunk of Chimay cheese we had in the fridge, and passing it around, we realised the rind of the cheese had exactly that farmy richness. Logical, of course. But to me it’s oh so good, and again, it’s obvious that aged Chimay Grande Réserve will remain in my list of top ten Belgian beers.